The Congress re-launched the newspaper, now in Hindi, today saying the party and its leaders have always "supported true and fearless journalism." The Congress, led by party chief Rahul Gandhi and former Prime Minister Manmohan Singh, re-launched the Navajivan newspaper today. The Navajivan was a Gujarati monthly that was launched by Mahatma Gandhi during the independence movement. It later became a weekly newspaper. In November 1947, the newspaper was published by the Associated Journals Ltd. The Congress re-launched the newspaper, now in Hindi, today saying the party and its leaders have always "supported true and fearless journalism." The newspaper had been shut down several times during the British rule. The party's official Twitter handle posted a video of the re-launch of the newspaper on Twitter. Rahul Gandhi also tweeted in Hindi, "with the release of Navajivan, we are reiterating the message of truth. Navajivan will always fight for you. Join this campaign of truth; Make it successful." The Navajivan was started to promote the ideas of Mahatma Gandhi, his methods in the freedom struggle and Jawaharlal Nehru's vision of modern India. Like the Qaumi Awaz and the National Herald, it also aimed to promote social harmony in the country. At the time, the aim of the newspaper was to speed up the creation of the values of Mahatma Gandhi, the modern, democratic, justice-loving, liberal and social harmony of the freedom movement. 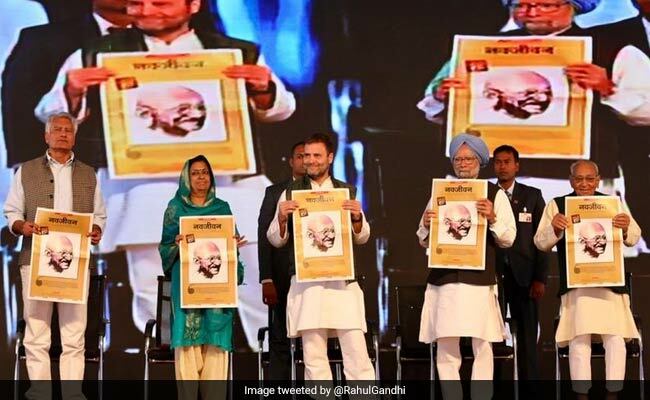 Congress leader and Associated Journals Limited chairman Motilal Vora on the occasion said after Mahatma Gandhi was sent to jail in 1920, he had asked Jawaharlal Nehru to run the paper. The newspaper provided a voice to many influential leaders who helped shape the Indian Independence movement. Many Congress leaders attended the launch event. Punjab Chief Minister Amarinder Singh could not attend the event due to ill-health.